To participate in an ICO, you have to usually send Ethereum or Bitcoin to the wallet address of the ICO offering company from your wallet. 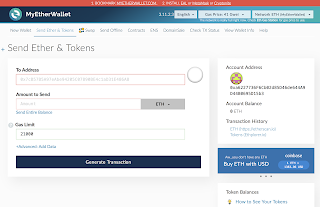 Most of the ICOs now-a-days ask for an ERC20 compatible wallet to send Ethereum token from and receive their crytp coin or token in that wallet. Amongst many available ERC20 wallets, one of the most popular online wallet is MyEtherWallet - https://www.myetherwallet.com/ . Here is an example of how would you create a wallet there and participate in an ICO of sether.io. I am using sether.io just as an example because I recently participated in it. But the steps should be similar for most other ICOs as well. Step 2: Pass through the welcome wizard to land in the New Wallet tab where the site is asking you to give a password to create a new wallet. Step 3: Give at least 9 characters long password and click on Create New Wallet. Step 4: You will be taken to a page that asks you to download the keystore file that is generated for you. Save that file in your computer although you may never need it again. Step 5: Click on I understand. Continue. Step 6: Click on You will be shown your private key in the next screen. This is the secret key that no one other than you should have. Keep it as securely as you can and never loose it or share it with anyone. Step 7: Click on Print Paper Wallet. A good idea is to take 2 print outs of this and save it in 2 different locations that no one other than you can ever access. But remember that if you loose the private key, any crypto coins or tokens you have in that asset are all lost. No one will ever be able to get it. There is no customer support, there is no hack - nothing can get you back your coins. Step 8: Click on Save Address. 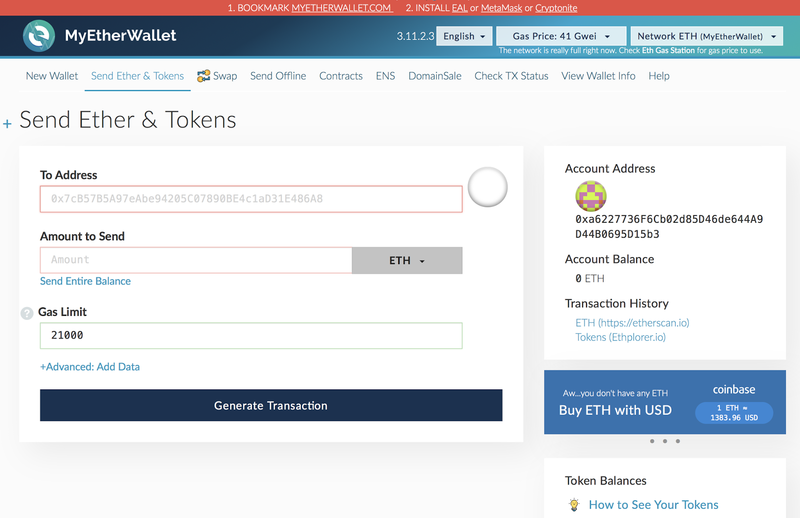 Step 9: Now you can see your ETH balance in your newly created wallet. Step 11: Click on Buy Tokens and follow the instructions. Step 12: At some point they will ask you the amount of tokens you want to buy. For example minimum amount for sether to buy is 0.1 ETH. Put the amount you want to buy. Step 13: In next page they will ask you to transfer that amount of ETH from your wallet to their wallet address. Step 14: Come back to your MyEtherWallet's Send Ethers & Tokens tab. Step 15: Unlock your wallet using your private key. Step 16: In the To Address you copy the wallet address of sether.io (or whatever ICO you are trying to participate in). Step 17: In the amount you put the amount to send and leave the Gas Limit as default whatever was populated (for example 21000). 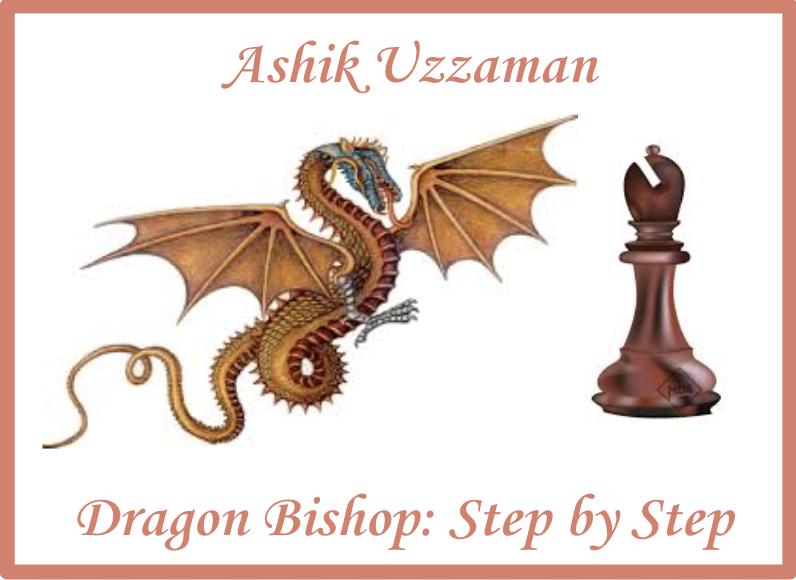 Step 18: Click Generate Transaction. Also confirm the transaction in subsequent prompts. Step 19: Wait for your ICO company to acknowledge the transaction and send you their tokens at a later time (or instantly in the case of some ICOs like sether.io). Step 20: For some ICOs, you may have to click on Show All Tokens link in your MyErtherWallet to find your token. For some others you may have to click on Add Custom Token and follow the instructions given by your ICO to make that token visible to you in your MyErtherWallet account.